Welcome to The Alcove, an experiential retail space bringing unique activations to Central Place in Downtown Rosslyn for a limited, two-month engagement. The Alcove is the result of a collaboration between the Rosslyn BID, Arlington County and local businesses who donated their expertise, materials and even the actual storefront (thanks JBG SMITH!). At The Alcove you can shop for used books, browse handmade items created by local artisans, or enjoy live music, author talks and fitness classes. This is a special place built by the community for the community. Here's a behind-the-scenes look at how it all came together. The Alcove, a limited-edition pop-up shop, opens August 8 at Central Place in the heart of Rosslyn. For two months from August through September, this two-level, 5,000-square-foot store with floor-to-ceiling windows will be a spot to purchase a variety of retail goods, including jewelry, household products, used books and gourmet food. But not just a place for retail transactions, it will also be somewhere that residents, workers and neighborhood visitors can go to relax, unwind and participate in an ever-changing roster of free events and programs, including author talks, neighborhood game nights, live musical performances and fitness classes. The idea for a pop-up retail shop in Rosslyn came about when JBG SMITH Development's Ben Spiritos told the Rosslyn BID that a space was available at Central Place. He asked if the BID wanted to do something with it. Having just completed the latest neighborhood perception survey and other commercial real estate studies, the BID wanted to address a desire to support local shops that had been voiced by survey respondents. 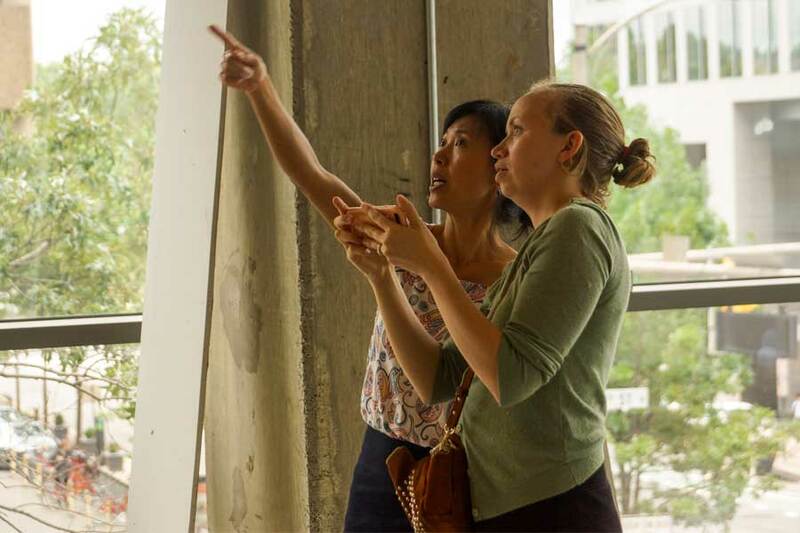 While the number of restaurants and retailers in Rosslyn has continued to grow and more are on the way, the BID wanted to inject something fresh and new into the retail scene while many of these spaces were still under construction. Spiritos' offer of a prime storefront—which could be used in the short-term to bring in more local retail—was too good to pass up. JBG SMITH generously agreed to provide the space for two months while the new tenant was getting ready to move in. On one of the neighborhood's busiest pedestrian streets, the location was ideal. But what kind of retail would the space provide? And how could it be more than just another pop-up? Armed with research and knowledge gained from planning more than 165 events per year, the BID team envisioned something that offered retail coupled with memorable experiences that the neighborhood would enjoy. "Retail trends show that people don't want to just come in a shop and purchase an item, like a book of cocktail recipes. They also want to hear from the author or learn how to make a new drink for their next dinner party," Rosslyn BID President Mary-Claire Burick says. "We wanted to create a place that hosted these types of events—author readings, mixology classes—on top of traditional retail. We knew this would really amplify the experience." Spiritos says JBG SMITH is excited for the additional activation The Alcove will bring to Central Place before their tenant moves in. Although numerous vendors will locate in The Alcove on a rotating basis, the main retail element is Turning the Page, a local non-profit dedicated to engaging parents in local public schools for student success. They sell high-quality used books, CDs and DVDs, with all books under $5. With this new space, the organization seeks to build on the success of the Rosslyn Reads! Spring Book Festival in April, where it sold over 6,000 books and media and raised more than $20,000—its largest single-day sales ever. 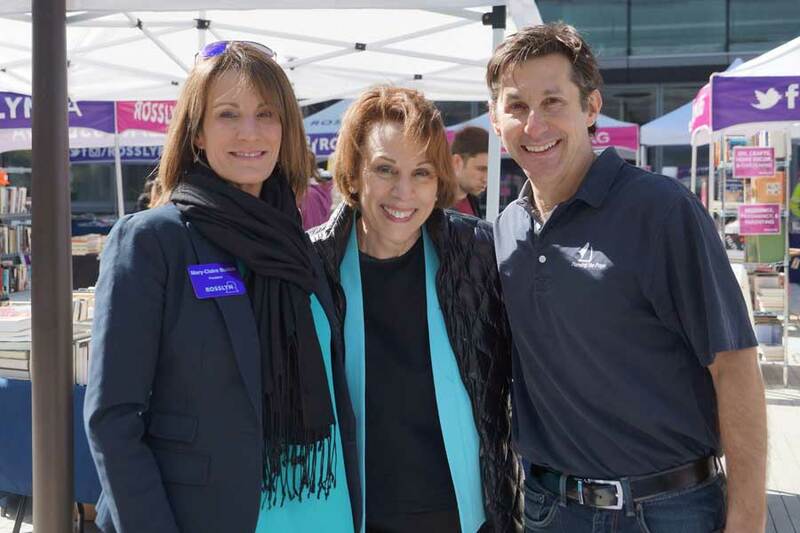 "We've done a lot of pop-ups and we were blown away by the support we received from the Rosslyn community," says Jason King, president and chief executive officer of Turning the Page (pictured above with BID President Mary-Claire Burick and Arlington County Board Member Libby Garvey). "We knew immediately that we wanted to engage with this community again. When the opportunity to be The Alcove's primary retailer was presented, we didn't hesitate to accept." It takes a village. Construction expertise doesn't hurt either. This project could never have happened without the support and commitment of Arlington County (Inspection Services, Zoning, the Commissioner of Revenue and Arlington Public Library get special shout outs!) and a network of generous partners. These are the people who liked the idea of pop-up experiential retail and had the power to make it a reality. As a nonprofit organization, the Rosslyn BID could not have built The Alcove without them. The space secured thanks to JBG SMITH, the next step was to figure out what to do with it. Gensler offered the pro-bono design services of a team of young and talented designers. DAVIS Construction served as the general contractor, and has donated time, money and materials to The Alcove. A local company that focuses their work in D.C., Maryland and Virginia, their participation has been motivated by a desire to make a difference in Rosslyn, especially since many of their employees live here. "Because DAVIS has been so active in Rosslyn, we really wanted to give something back to the neighborhood," says Senior Project Manager Adina Salomon. DAVIS' impact on Rosslyn can be seen everywhere you look: Since 2010, they have worked on more than three million square feet of construction in the neighborhood. This includes high-profile projects at CEB Tower, 1812 North Moore and 1701 North Fort Myer. In addition, DAVIS reached out to their subcontractor community to bring other experts into the fold, some who are named here and others who donated materials anonymously. DAVIS brought J.E. Richards on board, which is doing all the lighting fixtures and outlets for the space, and W.E. Bowers, which is providing all the temporary cooling. Meanwhile, Cochran and Mann is painting the walls and one of their longtime engineering partners GHT Limited is helping with mechanical and engineering design. Capitol Drywall also joined the effort, adding much more than drywall, injecting creative touches throughout The Alcove and often repurposing materials left over from other Rosslyn projects. "This project has been more creative than just putting some walls up," says Capitol Select Companies Director of Marketing and Business Development Jill Sorenson. "We're adding accents. For instance, when we hang ceiling tiles, they are hung from a metal frame, called a grid. For this project, we're putting up the grid and suspending it from the ceiling but not putting any ceiling tiles on it. This will give the space a cool, industrial look. This will also allow the BID to hang décor, lighting and different design touches from the grids." Capitol Drywall Vice President of Field Operations Cam Sokoloff designed two drywall chairs for The Alcove that are framed with wood. Although the chairs' designs definitely go outside the box, they are still fully functional. 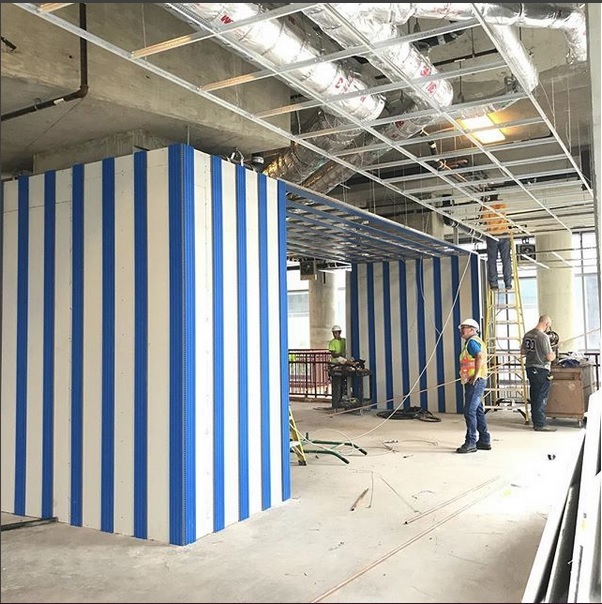 Capitol Drywall is also using blue slatted wood to accent columns in The Alcove. The wood, which is a Swiss product shipped here from Denmark, is left over from another project for a global brand here in Rosslyn (it's being installed by the Capitol Drywall team in the photo above). Capitol Drywall also enlisted the help of United Rentals, who donated a lift, and Capitol Building Supply, who donated 40 pallets to be used for tables and displays. Like DAVIS Construction, Capitol Drywall is no stranger to the neighborhood. They are part of a family of companies that has worked on 186 jobs in Rosslyn over the past five years. Capitol Select is the marketing arm of the family, and includes Potomac Surfaces, Selective Demolition, Selective Hauling and Selective Wrecking & Abatement. Although Capitol Drywall is the only Capitol Select company involved with The Alcove, all other companies have been very active here for years. "The amount of work we've done here really shows the amount of growth Rosslyn has experienced," Sorenson says. "That's awesome!" On the marketing side, the participation of Streetsense has been invaluable. An experience-focused strategy and design collective, Streetsense has contributed their expertise in marketing, messaging and retail merchandising. Over a fast and furious two months of planning, The pop-up has gradually taken shape. In July, it became "The Alcove," a name meant to establish it as a central neighborhood destination that people would recognize and seek out. Soon, a website appeared. A press release was ready to go. Events, one by one, materialized on the event calendar. There were readings by well-known authors arranged by a terrific team at Arlington Public Library. There were live musical performances. There was an Etsy shop where shoppers could buy home decor, beauty products, apparel and more. There was even a day-long nail bar where busy workers could—at last—get their nails done in Rosslyn on the lunch hour. Every day, the space looked more and more finished. The day-to-day planning for The Alcove is being led by Senior Events Manager Sophie Barral and Vice President, Finance and Operations, Santya Lanman (picture above while working to get The Alcove ready). What kinds of work have they been doing? "We're doing everything from coordinating construction and design to coming up with displays, planning programming and figuring out day-to-day operations once The Alcove opens," Lanman says. "Essentially it's felt like we're opening up our own store." According to Barral, the enormous amount of programming would not have been possible if not for Arlington Public Library who is organizing more than 20 events for The Alcove. In addition to author talks and story time, the Library is bringing a maker series to the pop-up that allows both adults and kids to explore art, books and crafts through curated activities. If there's one aspect of this project that stands out to Barral, she says it's been how enthusiastic the BID's corporate partners have been about creating The Alcove. "You would think that, as a community organization, the BID would have been the only one who wanted a neighborhood space like this for Rosslyn," she says. "But when we started meeting with our partners, it became clear that they really wanted this, too. These are all big companies that are busy with lots of clients and other jobs, but they have all been really engaged every step of the way. They are genuinely motivated to give something back to the neighborhood. It's almost like this is the really cool project they've been waiting for." The Alcove is located at the corner of 19th and N. Moore Sts. Beginning August 8, it will be open 11 a.m. to 8 p.m. Tuesday through Saturday until the end of September. For details and programming information, visit The Alcove's website. DON'T MISS THE GRAND OPENING EVENT AUGUST 8! DETAILS HERE.